Osceola Refetoff is a Los Angeles-based photographer. A Chicago native with Danish, Bulgarian and Canadian roots, Osceola is a master filmmaker and photographer. Osceola’s first love was film making which he studied at Duke University and then at New York University’s Graduate Film Program. Over time, Osceola’s talent for visual storytelling gravitated towards photography. His works reflect his passion for humanity and its impact it has on the world. These days Osceola’s focus is on the vast American West, including the magnificent California desert and the communities who used to inhabit there. 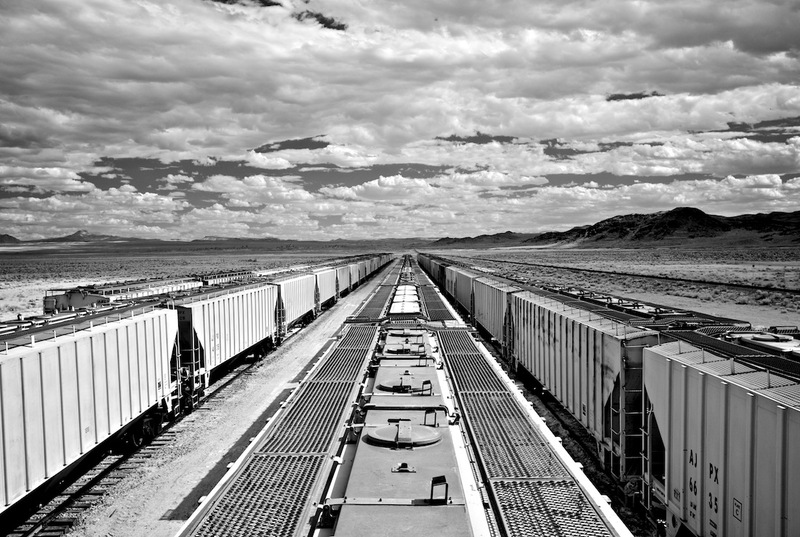 In collaboration with historian Christopher Langley, Osceola created “High & Dry,” a wonderful blog of stories and images that detail the stark landscape and communities in the California desert. 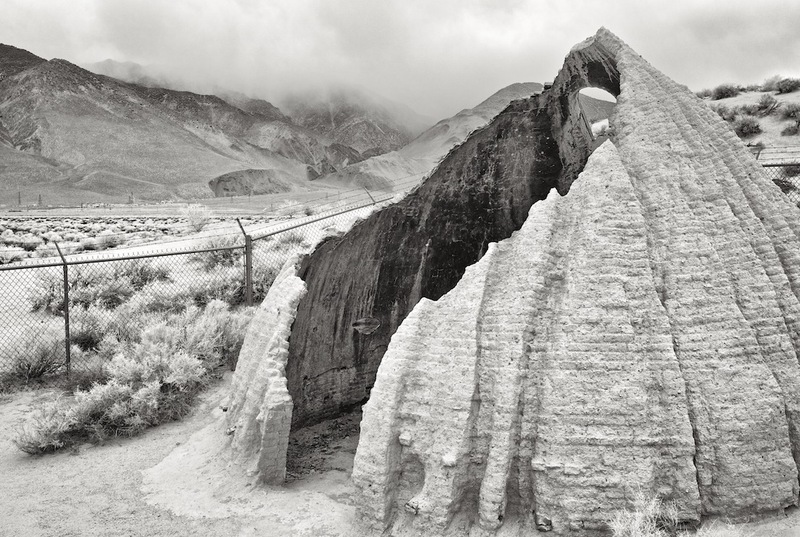 His works from his vast desert series are on exhibit at the Porch Gallery in Ojai through the end of March. This week Osceola talks to atlas about his start in photography, why the California desert appeals to him, and why it is important to document the natural beauty and stories of desert life. I do not have one of those heart-warming stories where I got a camera at age five and knew I wanted to be a photographer. Mostly as a kid, I was into blowing things up and generally causing trouble. It was not until much later – in my twenties – that I got interested in photography, and even then there was not a sudden “ah ha!” moment. At some point, I was living in New York City and found myself carrying around a couple of small cameras at all times — one with color film and one with black & white. You brilliantly capture a wide range of images — people, landscape, nature, objects — that show all aspects of our humanity. What is it about our humanity that draws you in as a photographer? I am fascinated by people and I enjoy observing and revealing their personalities, usually with their permission and at their best. However, much of my desert work is about the absence of people. Not straight-up nature shots, but humanity defined by the traces they leave behind. I am particularly interested in what desert ruins might have to say about who we are today as a society, and how that may be different from peoples of the past. If you look at Facebook, Instagram, and Twitter, it seems like everyone is posting photos and identifying themselves as a photographer. How do you create images that sets yours apart from all the rest? I am active on social media. I love being able to connect with a larger audience, far away. And although I do a lot of work that is experimental in nature – pinhole photography, infrared photography, long exposures – my general approach to photography is pretty traditional. To stand out in this crazy-cluttered environment, you simply have to shoot really well. For instance, I have a series “Armchair in the Sky” that I capture from the windows of commercial airplanes. When I started photographing the series on film twenty years ago, you did not see those kind of images very often. Now, everyone is shooting out airplane windows with their phones. If I want my images to stand out against the millions of airplane shots that are posted online, they better be really very good. So far I must have made a couple thousand exposures. After twenty years, I finally started exhibiting the series last July, and to date I have uploaded about twenty images to my website. So start with a specific vision, pursue that vision over the long haul, edit the results with ruthless determination, and print only the very best with a mindful, cohesive aesthetic. Personally, I like that there are so many “photographers” out there today. It keeps me on my game. Tell us a bit more about these stunning and beautiful desert images you have entitled “Ozymandias.” You have a masterful eye for light and style. What inspired you to capture these desert images? 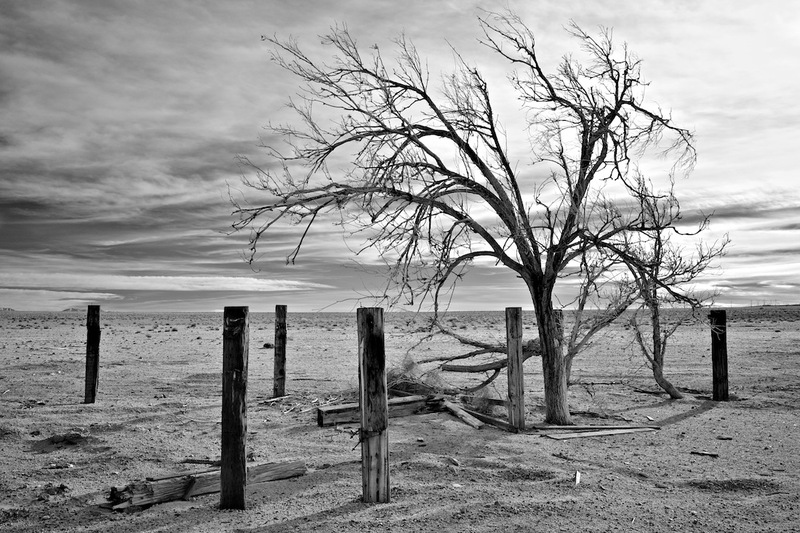 “Ozymandias” is the name of one of my black & white desert portfolios featuring the remnants of human existence strewn about in the California desert. I generally carry at least two or three cameras with me when I travel by car in the desert. Some images lend themselves to black & white exposures, and for these, I generally shoot infrared – either digital or film. The main reason for working in b&w is that, in the absence of color, all the emphasis is on form and composition. As an additional benefit, infrared makes the skies very dark, and the clouds (when there are clouds) are very pronounced. Generally, landscape photographers have a hard time making good images in the middle of the day, so they tend to favor “magic hour” light and shadow. Well, that leaves a lot of day on the table! I love “good” light too, but for me, the desert experience is much about the sun directly overhead. Black & white photography not only feels like the right medium to portray many of my subjects, but it also allows me to work all day long, capturing the relentless intensity of the midday desert sun. Your passion about the desert led you to start a blog called “High & Dry” about California’s deserts and those who reside there. What inspired you to start this blog? What do you hope to accomplish with this blog? I had been thinking for some time about collaborating with a writer because of the unique power that words and images have when they are presented in tandem. I was familiar with the work of James Agee/Walker Evans and Dorothea Lange/Paul Taylor when I met writer/historian Christopher Langley in Lone Pine, CA while working on a motion picture project. First and foremost, the purpose of our collaboration is to present cool and interesting stories about the California desert, illustrated with quality photographs. We are interested in the history of the desert, particularly in relation to human activity past and present. We are also documenting the massive transformation underway with the development of industrial-scale renewable energy facilities. Our hope is that familiarizing people with the history and natural beauty of the desert will encourage them to consider the future of this long-undervalued land resource. The project gets re-syndicated in a variety of media – local desert publications, glossy magazines, scholarly journals, and KCET’s “Artbound” – so we are able to reach a large audience from all walks of life. 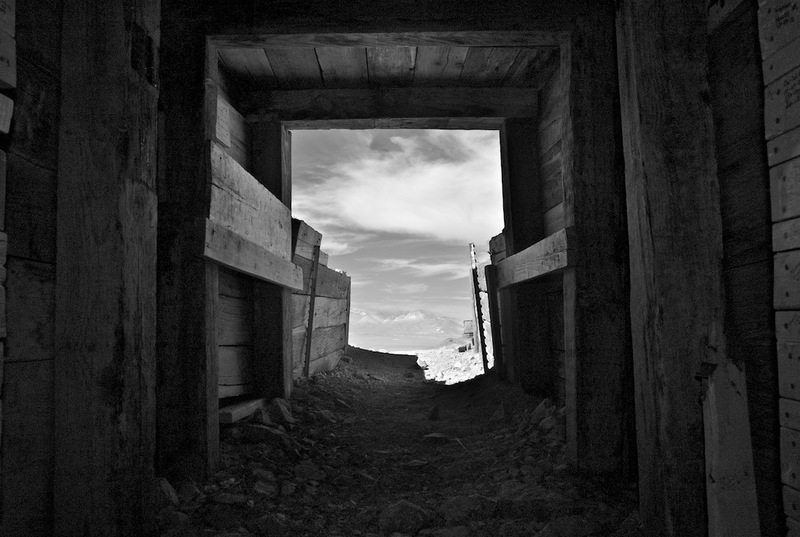 You chose to photograph these images in black & white which gives them a radiant aesthetic quality. Why did you select black & white over color? I love both color and black & white. Some subjects are suitable to both mediums, but others are distinctly better in either color or b&w. Because I shoot 99% of my b&w work in infrared, I have to make my decision on site, determining by the nature of the subject, which representation better suits what I want to express. In the desert, I usually photograph from a tripod, so sometimes I will make a similar exposure with both a color and a b&w camera. Are there any photographers who have influenced you? I came to photography later in life. Early on I was much more interested in filmmaking, eventually getting an MFA in film production from NYU. All through my late teens and twenties, when I was not in production, I would see ten or more features a week in theater. So my compositional style and my interest in visual narrative was heavily influenced by the great mis-en-scene directors I admire – Lange, Welles, Kubrick, Melville, etc. So today, I find myself interested in the meticulous framing of compositions in depth, I like to explore temporal as well as visual space in my stills, and I am obsessed with creating visual effects in-camera. I go to art presentations of all kinds – many of them! And I find that I’m as likely to be inspired by a painter or the lighting design of a stage production than I am by a photography exhibit. I only became interested in photography very late in the game long after I had developed what I consider my own visual style. I think I would enjoy hanging out with Man Ray or perhaps a late night out on the town with Brassaï. If you could give one piece of advice for a novice photographer, what would it be? Thanks for being our photographer of the week, Osceola! For more information about Osceola, visit his website. For more information about “High & Dry,” visit his blog. For more information about Osceola’s current photography exhibit at Porch Gallery, visit the gallery’s website. All images © Osceola Refetoff. Joseph Romeo: I got started rather late in life. A few years after I got out of high school, a friend of mine was taking a photography course at his high school and asked me to pose in some of his photographs. After an afternoon of taking pictures, we went to his house where he loaded the film into a canister, then poured these chemicals through a small hole in the top. I was intrigued. Once we got into the dark room and I saw an image come up in the developer tray, that was it. I’ve been obsessed with photography ever since that moment. That was back in 1981. I knew from that point on that I wanted to be a photographer. A couple of years later, I enrolled at Brooks Institute of Photography in Santa Barbara, California. Brooks was the launching point in my career. Once I left Santa Barbara, I was on my own. It is the commitment and perseverance that allowed me to do this for so long. In a way, I feel like I am self taught. I mean, yes I got a very good technical education, but learning how the business works and refining photography skills is something I had to do on my own, nd will continue to do throughout my life. Once I graduated from Brooks, reality set in, and I needed to figure out a way to make a living in photography. Being a fine art photographer seemed to be a path to dependency. I started shooting architecture and that’s what I specialize in today. Of course, I set out as often as I can to photograph what appeals to me. Which genre do you enjoy shooting the most and why? I have many varied interests, and I find myself being pulled in many different directions when it comes to different genres of photography. Over the years I have collected a rather eclectic array of images. 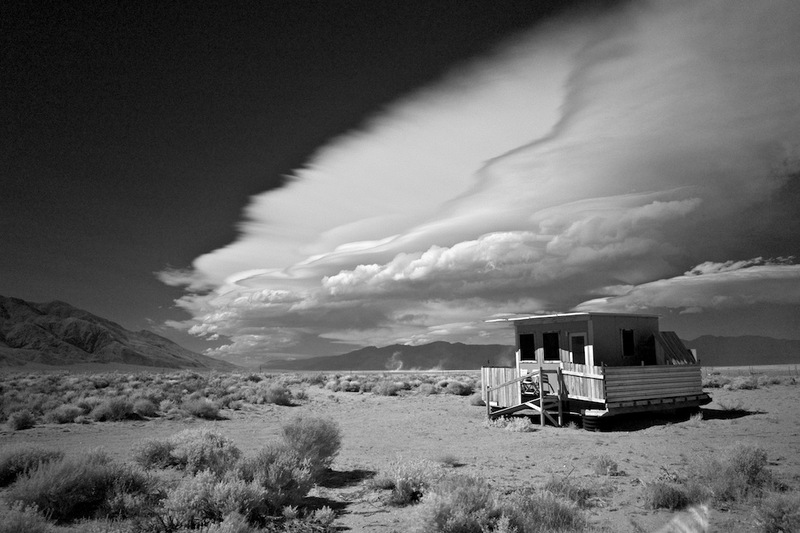 In my earlier days of shooting, I wanted to do what Ansel Adams did especially after seeing his work in person. I read all of his books and taught myself the zone system. I am even more impressed with his work knowing he did what he did without the use of the latest digital tools. I love black and white photography, but not every image works in monochrome. I love color as well. When I set out to take pictures, I don’t plan in advance whether I’m going to shoot in black and white or color. Once I decide to set up the camera and focus on my subject, I try to make that decision at that time. 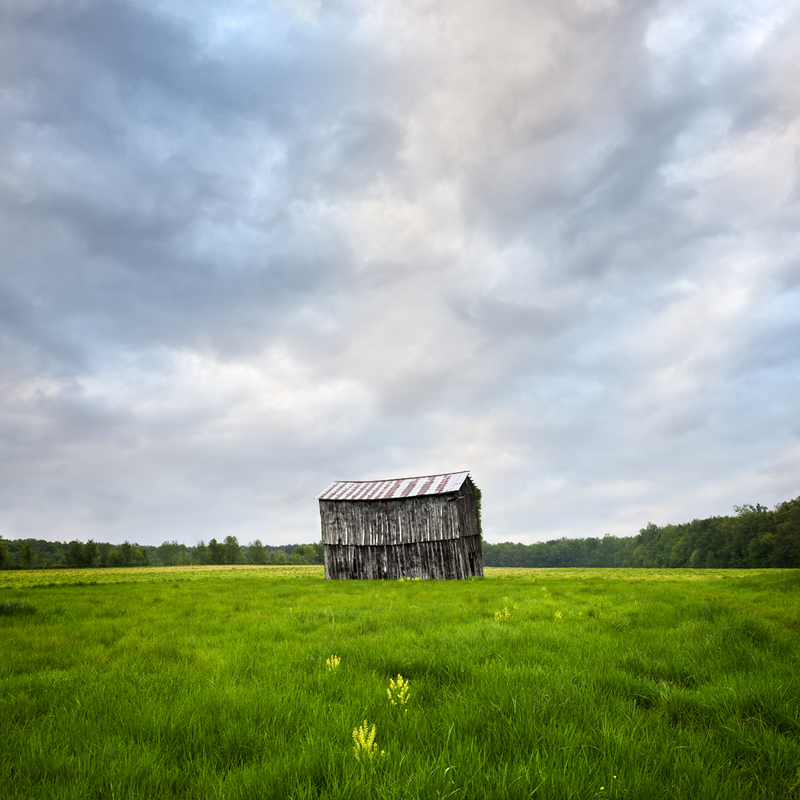 Your barn images are striking, skillfully composed, and have an element of quiet beauty. Can you tell us more about your barn series? 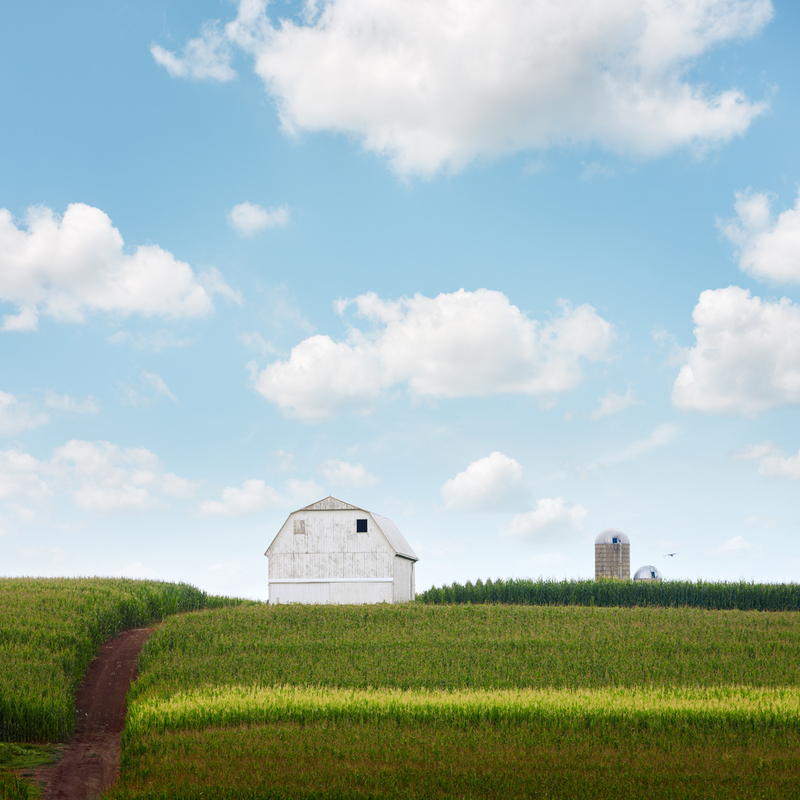 What inspired you to photograph barns? Thank you. 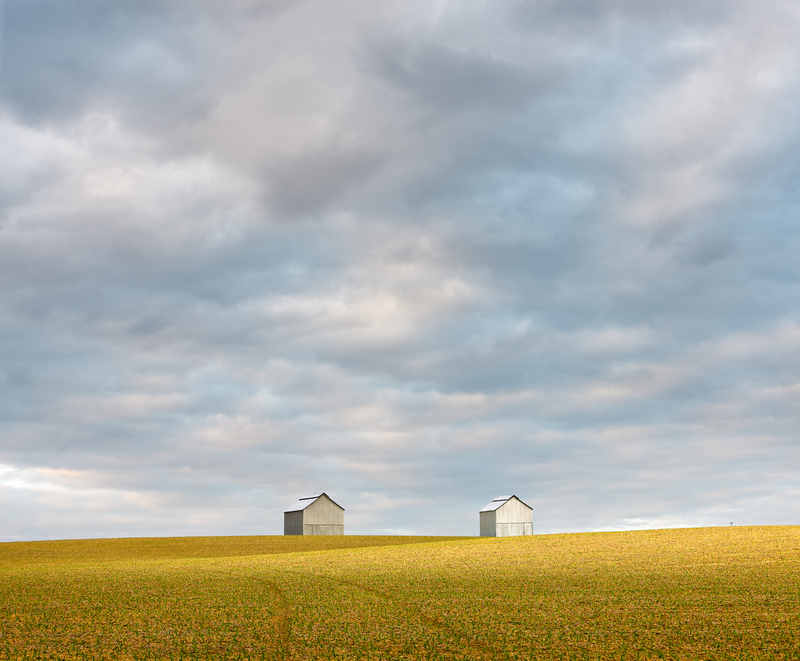 I started photographing barns and abandoned buildings by chance. I am drawn to abandoned places. Like many others, I find a certain beauty in decay. My objective is to make beautiful photographs out of subjects that may be perceived as unattractive. I often wonder: what happened and why? This may be rooted in my love of history. I do not really think of these structures as a series. Sometimes I feel that if I think too much about photographs as a series, it may force me to compose or interpret a photograph to match an existing body of work for the sake of consistency. I think that may compromise the strength of some of the individual photographs. Most of the barns are shot in Kentucky. What is your connection to Kentucky? I do not have any specific connection to Kentucky. I first visited the state while I was on a photographic assignment a few years ago. When I travel, I always allow for extra time to explore once my original assignment is completed. While in Kentucky, my aim was to drive down as many back roads as possible and let serendipity play a role. I really do not like to plan too much. There is something very peaceful and relaxing about driving down country roads (without someone tailgating you). 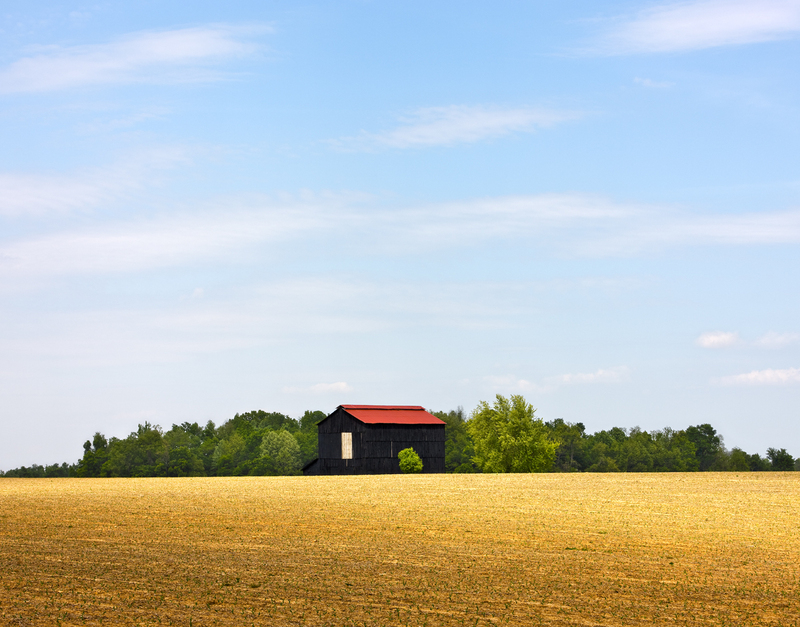 The Kentucky countryside is just so beautiful and bucolic. The prospect of finding something interesting to photograph around the next bend is pretty exciting. Did you encounter any challenges while shooting this project? The biggest challenge always seems to be the weather. When I am on the road searching for something interesting to photograph, the issues of lighting and weather play a major role in whether the photograph will be a successful . If it is not “right” at that time, then I have to decide — wait for the conditions to be favorable or forget it and move on. Usually, I wait. The photography industry has changed quite a bit over the years what with digital dominating the field. Do you think it has changed for the better or the worst? I feel very fortunate to have had a lot of experience in photography before the digital revolution. It gives me a perspective that I do not think I would have if I started out shooting digitally. Back in the early days, I shot almost exclusively with a 4×5 view camera. It is a difficult camera to master. If nothing else, it teaches you patience and persistence. It is a very deliberate and slow process, which forces you to really study your subject matter before finally setting up the camera. I now carry that experience and work ethic with me when I am shooting today with a digital camera. It is easy to just shoot like crazy today with your digital camera without the worry of film and processing costs. In today’s culture, people want to see their results right away. I think it is detrimental in a way because it is important to “feel” and absorb what you are photographing. Making the transition from film to digital was a bit painful for me and required a lot of time and commitment. I think the best thing about digital photography is that you have so many more tools to work with. The worst thing about digital photography is you have so many tools to work with. What I mean by that is when it comes to post production, your options seem infinite. You need to develop vision in order for you to make your photographs work. The biggest challenge is to pre-visualize while working with the camera and decide at that time what you want the image to look like in the end. One thing that has changed shooting digitally is how I and others approach the actual shooting process. Bracketing for expanded dynamic range, focus stacking, shooting over a period of time, while your subject moves and changes, are some of the things I plan out in advance. My approach to photography is that I do not let circumstance dictate what my images will look like. In other words, I will use the digital tools available to get the look I want if I have to. Making consistently tasteful decisions during the post processing phase of the creative process is paramount to creating successful images. How do you see your work evolving over the next three to five years? I am not sure how my photography will evolve in the future. I know this, however, I’m always learning and growing and I feel that I’m a better photographer than I was just a month ago. I need to work hard on the pre-visualization process so that I do not feel as compelled to change my images as time goes on. I have a tendency to want to reedit some of my photographs which I find a little concerning. I also plan on doing a lot more traveling. I want to go back to China and Cuba. One thing that I am also hoping to get is gallery representation. Do you have any words of advice for aspiring photographers? If you want to get into photography professionally, you must be incredibly passionate and persistent about taking pictures. Work hard and have a thick skin. The competition is fierce. If you are getting into photography for the fun of it, then do just that — have fun. Look at a lot of photographs — as many as you can. I know some photographers who do not think that is a good idea because you may be too influenced by other people’s work and your images will not be original. I could not disagree more. All artists — no matter the genre — whether it is photography, music, painting, acting, you name it, is influenced by someone. Just be aware of this and try to find your own way. One more thing: take a lot of pictures. Back in the film days, someone once said something like the difference between a good photographer and a bad photographer is a thousand rolls of film. Thanks for being our featured photographer of the week, Joseph! For more information about Joseph, visit his website. All images © Joseph Romeo. Robert Walker: I was about 8 years old and on a family holiday. When we returned home we went to the local chemist to collect my roll of film and my Dad’s. We were told only one roll had any images on it. Everyone looked sympathetically at me, only to discover it was actually mine that had come out. I think my future was decided that day! Self taught, no photographic qualifications. Worked as an assistant / dogs body. I think there are pros and cons to this method. In my opinion, photography is not a theoretical pursuit. The only way to learn is to take pictures. If you spend too much time thinking about it and looking at other people’s work, it can then be intimidating to get out and make your own. When I left school, I knew I wanted to be a photographer. But I did not know what field of photography to pursue. I worked for three years as the only assistant to two small town industrial/commercial photographers. After the second year, they started sending me to do the jobs on my own which increased my confidence and made me interact with clients face to face. After a year of doing all the photography on my own, the company went bust (the two photographers were not good at business). I bought all the equipment from the liquidator for £1000 and started on my own the next day. All the clients stayed with me and I was up and running at age 20. Over the next thirty years, I steadily built up a small bespoke advertising studio in the UK. In 2007, I decided to concentrate purely on my own work. 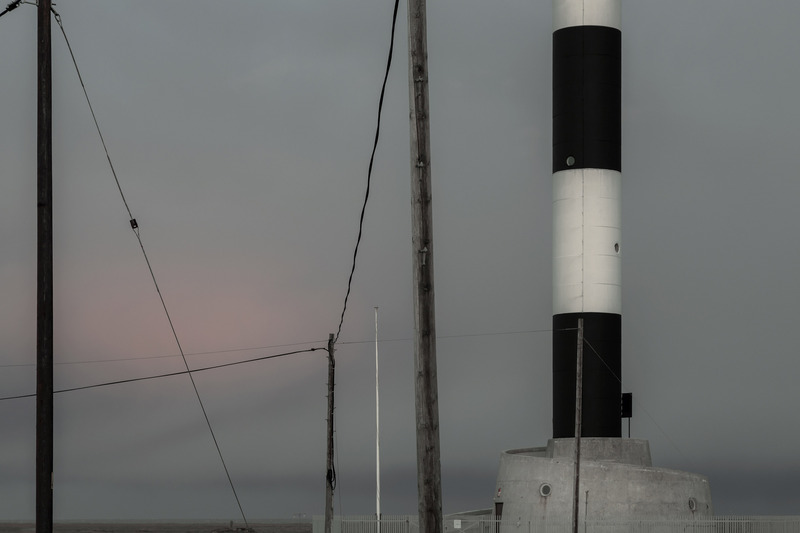 Your “Fifth Continent” project is a collection of brilliant and stunning images you took of Dungeness, which is off the coast of Kent in South East England. Dungeness is known as England’s only desert. What drew you to Dungeness? Why the desert? The landscape is an expanse of flat shingle which runs for approximately three miles. The English Channel is on one side separating the UK from France and the rest of Europe. 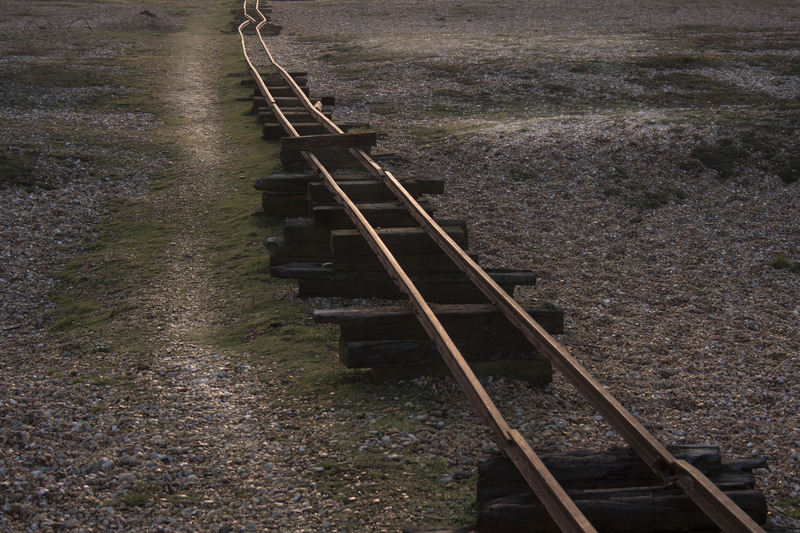 Dungeness has two nuclear power stations, two lighthouses, and a miniature steam railway which chugs along the coast. The area’s main industry used to be fishing. 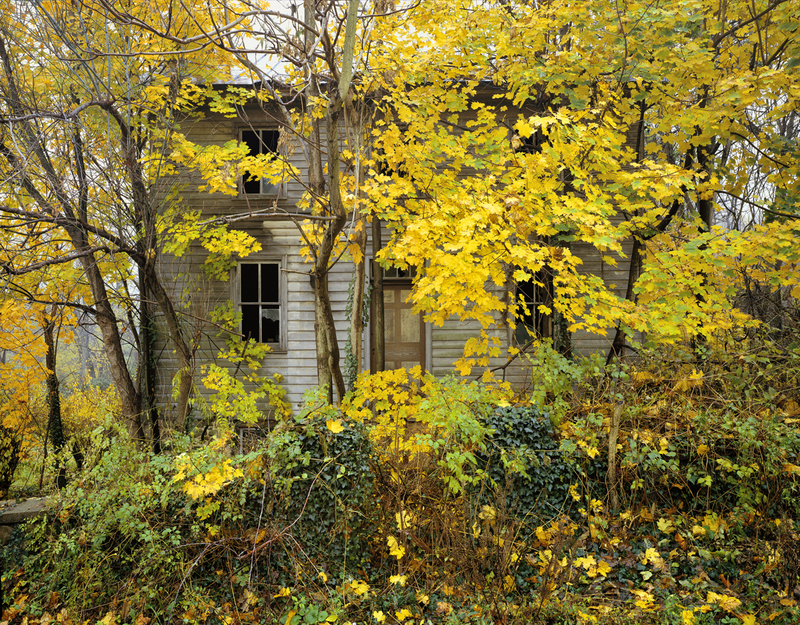 The majority of residents now tend to be artists, writers, and those escaping conventional life.What makes the place photographically interesting are the clusters of buildings that sit on either side of the single track road and the constantly changing weather. Many of the huts started life as old railway carriages, which were used as shelters for the fishermen or modified into basic living accommodation. Most of these have been abandoned or have literally blown away, leaving just a baseplate and a stain on the shingle. Others have been slightly gentrified and some have been rebuilt in a very exacting contemporary style. Being only two hours from London the area is becoming a weekend retreat for creative individuals. How would you describe the landscape at Dungeness? What was it like to shoot and explore there? The main challenge with any photograph you make is not to repeat too closely what has gone before. 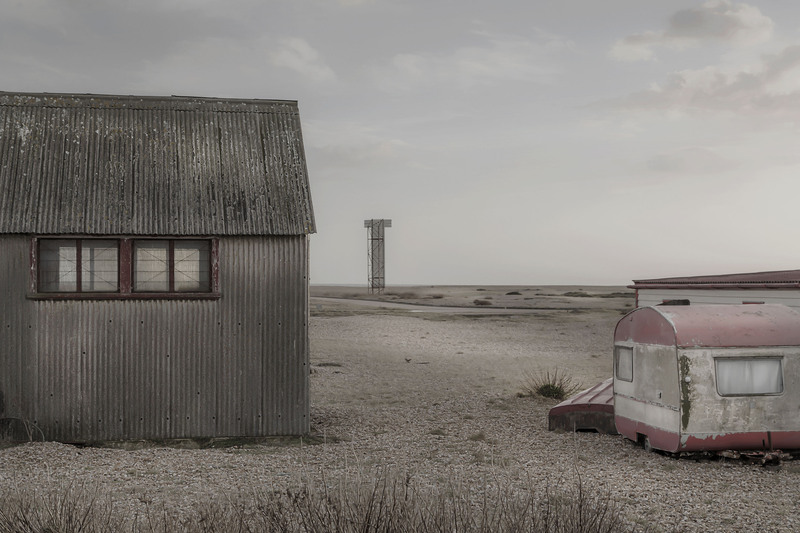 Dungeness has been photographed many times over. In the summer, there are swarms of day trippers all with cameras and all photographing the same thing. I decided from the start that my project was not a record of the place. I did not feel the need to document every detail. Instead I wanted to capture the essence, the emotion that I felt the first time I went. I deliberately chose days when the sky was not blue and the grasses were not at their greenest. I wanted to evoke the feeling of desolation and isolation, deliberately not including people in any of the work. It is an accurate reflection of a Dungeness that does exist much of the time. When I worked in advertising everything was shot on large format, big tripods, cases of dark slides — you name it we used it. Now I have pared my equipment down to the absolute minimum. I use a Canon DSLR, a 24-105mm lens, sometimes a monopod and very occasionally a tripod. 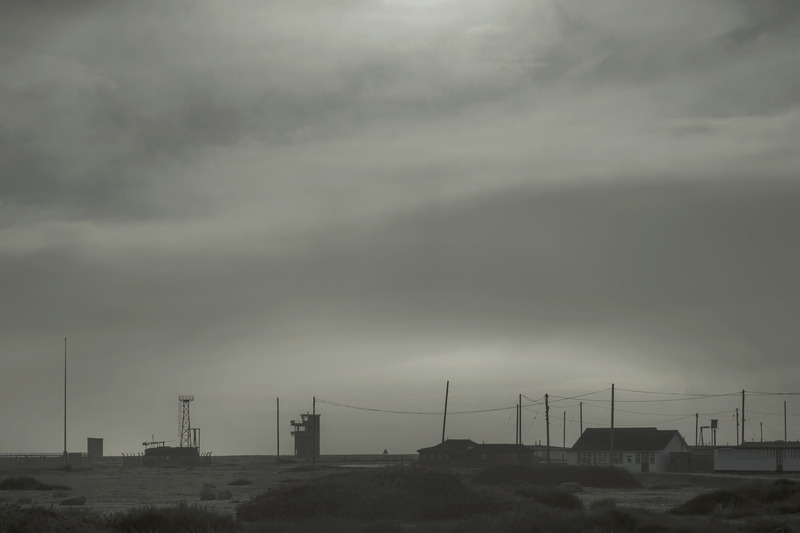 Did you encounter any challenges while shooting in Dungeness? The only problem with shooting there is the weather, which ironically is one of the reasons I was first attracted to the place. Your project is currently on exhibit at Touchstones Gallery in Rochdale. Lancashire? What do you hope your viewers will take away from your images? I was fortunate to get the show at Touchstones, which is a public gallery close to where I live. There are 21 images, most of them printed 1 meter wide. I had the walls painted a dirty grey and I commissioned a composer friend to make a soundscape which accompanies the show. 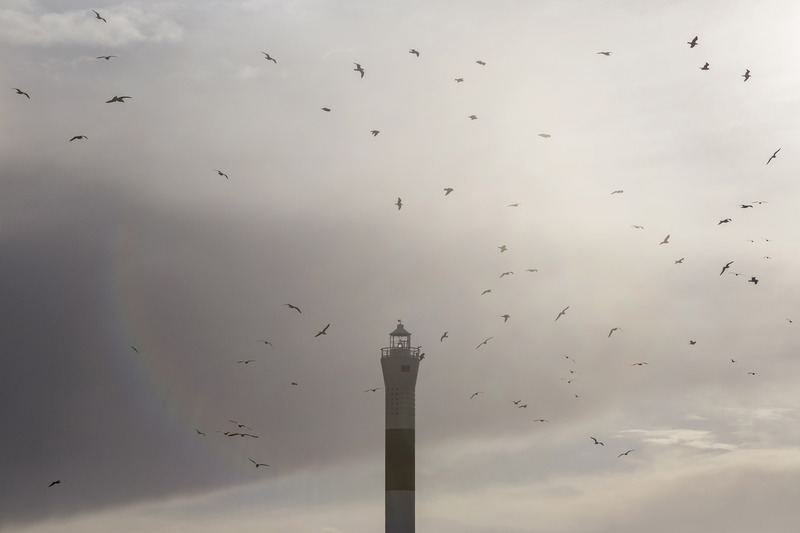 The sound was important to me because at Dungeness all you can hear is the wind, the sea, the birds, the creaking of the nuclear power stations and the occasional blast of a fog horn from the lighthouse. This is something I have not done before, but it really helps people to feel more immersed in the work. The most popular comment in the visitors’ guest book has been how they want to make the trip to Dungeness, how they want to experience the landscape for themselves. I just hope they do not go on a sunny day. How do you see your work evolving over the next few years? To be honest I am not sure how my work will evolve. I guess that is the nature of evolution. Change happens slowly and it is only when you look back at your work over the years you become aware of this. I do plan to be more proactive about getting my work shown. I also aim to invest some time to try and understand social media, which is something I have ignored to my cost so far. I do have an Instagram page (@robertwalker100) and would welcome more followers. 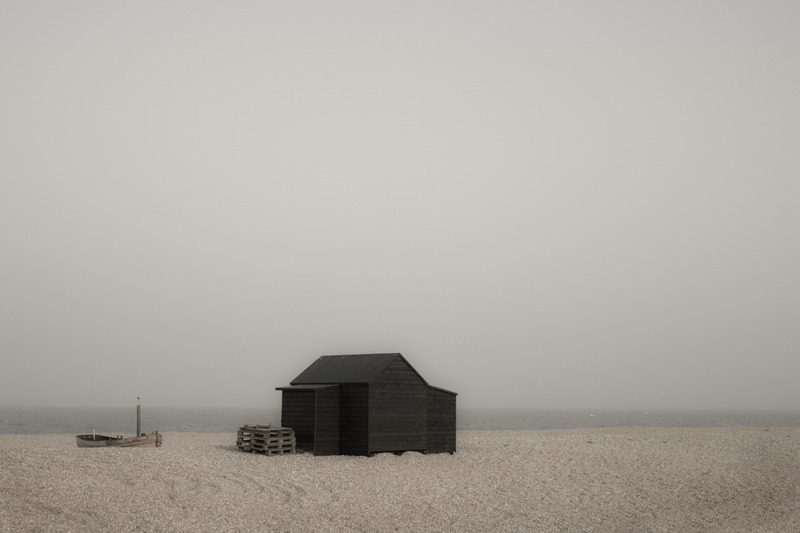 First, I would like to get The Fifth Continent into a gallery space near to Dungeness. Second, I have a project which is very close to completion with a working title of “The Art of Escape” although I mostly shoot single “stand alone“ works. My advice for a novice photographer would be not to get hung up about equipment. Owning a certain bit of kit will not make you a better photographer. The only way to improve is to take pictures as often as possible. Learn about exposure. Do not just set your camera to “Auto“ and do not be afraid to make mistakes. It is the only way to learn. Thanks for being our featured photographer of the week, Robert! For more information about Robert, visit his website. All images © Robert Walker.